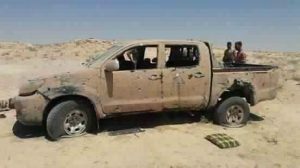 An attack on a Libyan National Army (LNA) checkpoint in central Libya’s Jufra district has left 11 people dead, two of them civilians. Initial reports spoke of a suicide bombing but the attack was in fact carried out by a large armed group who struck at dawn and summarily executed members of Battalion 131 they found there. Some were shot in the head, others had their throats slit. Eight of the nine soldiers killed are said to have been from Sorman, west of Tripoli, and had served in Khamis Qaddafi’s elite Brigade 32 before the revolution. The ninth solider is reported to have been from Sirte as were the two civilians who were driving past the Fugha checkpoint when the attack occurred. The attackers, who are reported to have stolen weapons and vehicles before fleeing the scene, are variously said to be fighters with the so-called Islamic State (IS), Tebu mercenaries from Chad angry at their smuggling operations on the southern border being curtailed by LNA-linked forces, and forces linked to Usama Jadhran and the leader of the Benghazi Defence Brigades (BDB), Mustafa Sharksi. Remnants of IS are known to have regrouped and are said to be operating in Jufra district. Usama Jadhran is also alleged to be involved with them and in smuggling operations in the south of Libya. Sharksi and the BDB were allegedly involved in the Brak Al-Shatti airbase massacre in May in which 141 people, mainly LNA soldiers, were slaughtered. Condemnation of the attack has been swift and has seen competing sides unusually united in their reaction. Khalifa Hafter has promised that the LNA’s response will be harsh, a promise that was also made after the Brak massacre. The president of the House of Representatives Ageela Saleh similarly called on the LNA to “strike with an iron hand” the terrorists that had carried out the attack. In his response, Presidency Council head Faiez Serraj called those responsible for the attack as being totally devoid of any religious or moral values. To fight such terrorism, the army had to be united, he added. “This crime is a call to all parties of different persuasions to set aside their differences and unite in the face of terrorism, which does not differentiate between one region and another nor between one political view or another, and does not recognise the Libyan state on the ground”, a PC statement read. A united army to fight terrorism was also called for by Sabratha military council. In a separate statement, PC member Fathi Majbri said that there had been earlier warnings from himself and others about terrorist groups operating in the south but that nothing had been done. He also claimed that some political figures were supporting these terrorists. He too said that the lack of a united army provided IS with the opportunity to grow in Libya. Battalion 131, which combines elements of the former 32nd Brigade after the latter was incorporated into the LNA forces, lost two of its members in an attack by the BDB at Ras Lanuf airport in March.